Washington State Ferries and the Federal Transit Administration are relocating the ferry terminal in Mukilteo to improve safety and reliability of operations for vehicle and passenger traffic, and reduce congestion along Mukilteo's waterfront. Pacific Pile and Marine is demolishing an existing pier and dredging the shoreline at the new terminal location. 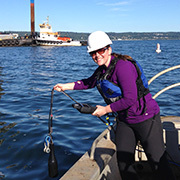 Meridian was retained to train employees in water quality monitoring methods to ensure compliance with turbidity, pH, and chemical standards throughout the construction period. Removal of the existing pier will eliminate thousands of tons of toxic, creosote-treated pilings from Puget Sound. 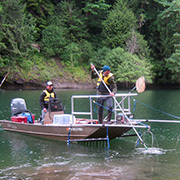 Meridian conducted a detailed assessment of the fish assemblage and water temperature regime in the Lake Merwin Canyon, which is influenced by discharge from the Yale Project powerhouse. Meridian quantified seasonal and diel fish assemblage and distribution by depth using tangle-netting and boat electrofishing. 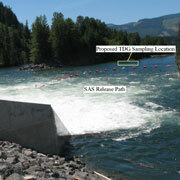 We measured water temperature patterns by anchoring four vertical thermistor strings in strategic locations and analyzed the detailed fish presence and water temperature data and related this to discharge from the Yale Hydroelectric Project. Fish presence was related to water temperature by depth and reach. Water temperature data was related to project generation and identified correlation between maximum water temperature, temperature fluctuation and project generation/discharge. Meridian made recommendations on operation changes to increase cold water habitat availability for cold water aquatic biota. Meridian consulted with the Department of Ecology, prepared a Water Quality Monitoring Plan, and conducted water temperature and TDG monitoring studies in the project power canal, surge arresting structure, and tailrace over a 10-year period. Hourly data was compiled, analyzed, and graphed to evaluate compliance with state water quality standards and the monitoring results were documented in a series of annual technical reports. Meridian monitored water temperature and dissolved oxygen for two years in reaches of the South Fork Snoqualmie River using two Hydrolab MiniSondes. Data were downloaded monthly to evaluate whether any exceedences of state water quality standards were a function of project operations or natural conditions. Hourly data were graphed and analyzed to determine monthly and daily maximums, means, and minimums, and temperature data were expressed as seven-day averages (7-DADMax). We also consulted with resource agencies and tribes, prepared annual technical reports and a successful Section 401 permit application to modify the project's required minimum instream flow releases.